After a week of our new normal around the Robinson house, we had our second chemo appointment set for yesterday, Wednesday, the 21st of November. Although Davis was very anxious and scared to go back to the hospital, Lily, Amanda, and I were all able to be there for support. It was actually really sweet to watch Lily hold Davis’s hand in the car on the way to the appointment. 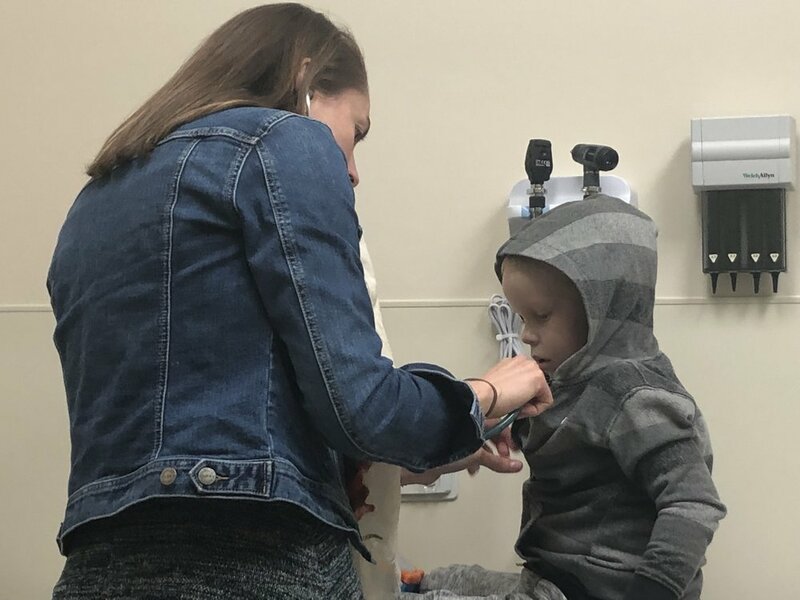 The process goes like this — they call us back for his appointment and take the usual vital information, and after that, the nurses access his port, take blood cultures and blood samples for testing. If all of his info looks ok, they give us the go ahead to receive his chemo treatment. The actual chemo this time took about 5 minutes to be infused through his port, which is amazing. In the future that won’t always be the case; but this time it was pretty quick. During the appointment, Amanda and I had a chance to talk to his main oncology fellows, Dr. De La Maza and Dr. Williams, and they both seem to be really fond of Davis. We actually received some really good news while meeting with them. In the case of Rhabdomyosarcoma (RMS) there are a few different mutations that they look for, alveolar and embryonal being the most prevalent. 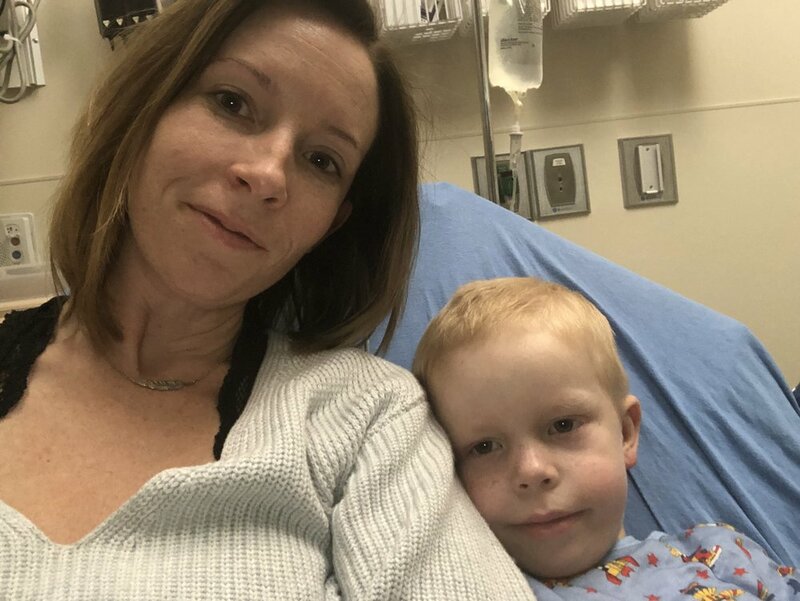 The good news...actually great news...is that after genetic testing of the tumor, they have determined that Davis has embryonal type RMS, which is the less aggressive form of RMS! Praise God for this victory along the way! The crazy thing is that in terms of embryonal RMS, we were told that he is 1 of 9 cases that have ever been recorded with RMS presenting in the location of his major tumor. Only NINE ever...absolutely crazy! We also found out that his ANC (white blood cell count) was very low at his appointment. His ANC was 120 prior to the infusion. To put this into perspective, the normal healthy ANC is 1500+, so his ability to fight other infections is really low. Although I internally freaked out upon hearing this, Davis’s ANC will fluctuate rapidly after all his chemo treatments and it is not abnormal to get very low. After getting home from the appointment, we found out the power of Zofran. Davis was doing fine until about 10:30 when he woke up in pain and was very obviously ill. The Zofran helped him get back to sleep, and he was fine the rest of the night. Praise God for good sleep! This morning everything was going well. Davis still seemed to have a bit of an upset stomach, but we were doing ok. While watching the Macy’s Thanksgiving Day Parade and playing on the couch, he started to feel warm. We checked his temperature, which was over 101, and off we went to the hospital. Our instructions from the hospital are very clear — a sustained temperature of 100.4º for an hour and we come to the hospital. If the temperature ever hits 101º, we immediately come to the hospital. If we have to come to the hospital, we are almost guaranteed to be admitted and have at least a 2 day stay, which is where we are now. Upon arrival, the emergency department immediately accesses his port, takes blood samples and cultures, and starts him on antibiotics. In order to go home, we have to be at least 24 hours with no fever, and if his cultures are positive for some form of bacterial infection, they have to be confident that they can clear it with oral antibiotics prior to us leaving. His ANC also has to be north of 200 and climbing, which seems like a long stretch from the 20 that he measured when we got here today, but apparently these numbers can rise quite fast at times so we are hopeful for that. Although I have a lot of optimism about our new normal, the past few weeks have been incredibly hard as well. We have been struggling though family decisions that we have to make for the next year. Both Amanda and I have had different days of being depressed and even sometimes downright angry. On top of this, I am trying to assimilate back into my work, which is a huge challenge for a lot of reasons. One of the hardest things in this season is that my dad and Davis’s namesake, Brent Robinson, died from cancer the day before Thanksgiving 6 years ago. It is really troublesome to be in or around a hospital during this time of the year for many reasons now. But as I’m writing this, it is Thanksgiving, and there are many things that I am thankful for. I’m thankful for friends and family. I’m thankful for the support of our community at Heritage Church, as well as the tons of support we have received from the greater Church community as a whole. Your prayers and emotional support have been palpable in our house, and we are blown away by the financial support that we have received. I’m also thankful for all the staff at PCH that help to calm our worries during these visits. Most of all I am thankful for the hope that only comes from knowing that God is in control of my life, and my family’s lives. No matter what happens in this life, God is in control; and as He has been teaching me lately, the choice that I have to make is whether or not to be dependent on Him. Thank you Father, for showing me that you are in control once again!